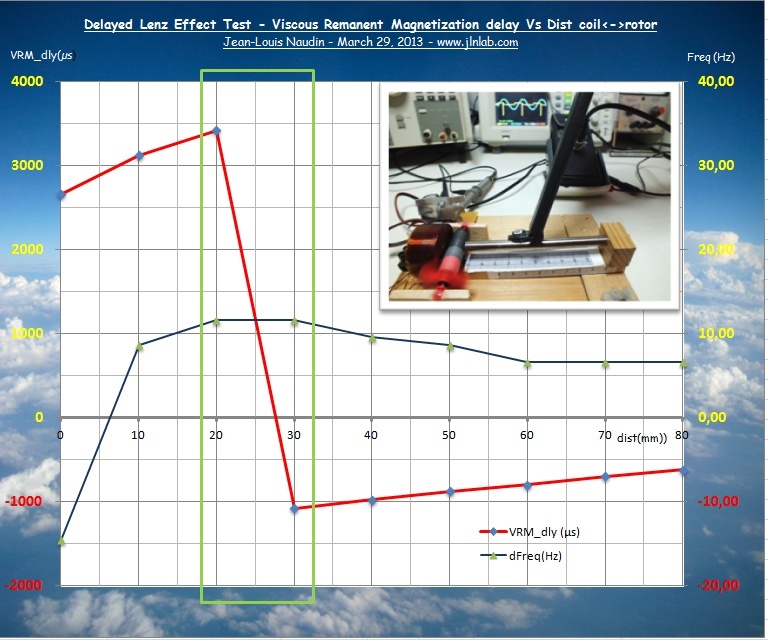 Mars 29, 2013 - DLE-TEST20 : So as to understand better the physical phenomenon of the Delayed Lenz Effect (DLE) which produces the acceleration of the magnetic rotor under certain conditions, I continue to explore in deep the effect by the experiments and the measurements. My tests platform dedicated to the study of the Delayed Lenz Effect (DLE-TB v1.0) is very useful and helpful for the exploration of this phenomenon. 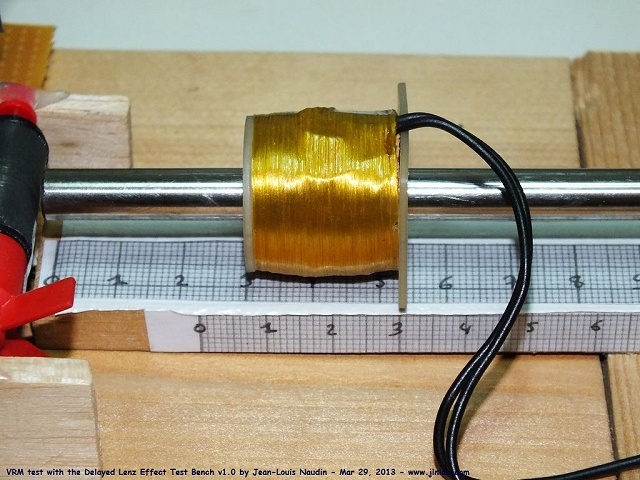 In the previous test DLE-TEST18, I have observed that the maximal acceleration of the magnetic rotor with the loaded secundary coil occurs when the coil is placed at 30 mm from the magnetic rotor. If the secundary loaded coil is placed between 0 and 30 mm from the rotor, the rotor brakes. In all the cases, the acceleration effect is observed with a secundary coil with a ferromagnetic core and not with an air core coil. In this experiment, I have used a soft iron core (120 mm length, 8 mm diameter). 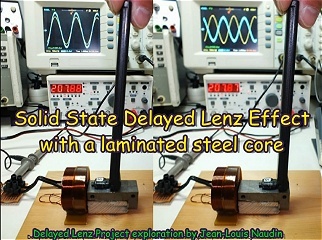 In a video of the test DLE-TEST19, it has been shown that the Barkhausen effect is very important with this kind of ferromagnetic material. Today, I have conducted the measurements with a Gaussmeter each 10 mm along the ferromagnetic core. The purpose of this experiment is to measure the temporal phase shift between the magnetic field produced by the magnetic rotor (near to its surface) and the magnetic field of the core (at a distance x mm). This effect is known under the name of Viscous Remanent Magnetization : When the magnetic rotor is set in rotation, it produces a magnetic fluctuation, this fluctuation is captured by the end of the ferromagnetic core and it propagates like a magnetic wave in the soft iron rod due to the Bakhausen effect already tested in the test DLE-TEST19. To measure the intensity of the magnetic fluctuation along the soft iron rod, I have used a Gaussmeter with its Hall probe UGN3503U (here the full data sheet of the sensor). A measurement is done each 10 mm. A digital oscilloscope is used to measure the phase shift between the magnetic field of the rotor (fully synchronised with the excitation coil pulses) and the magnetic field of this fluctuation at a distance of x mm from the magnetic rotor. The measurements fully confirm that the magnetic field of the fluctuation at a distance of x mm from the rotor is not in phase avec the magnetic field of the rotor in motion. Below, an animated picture which shows the phase shifting measured each 10 mm. 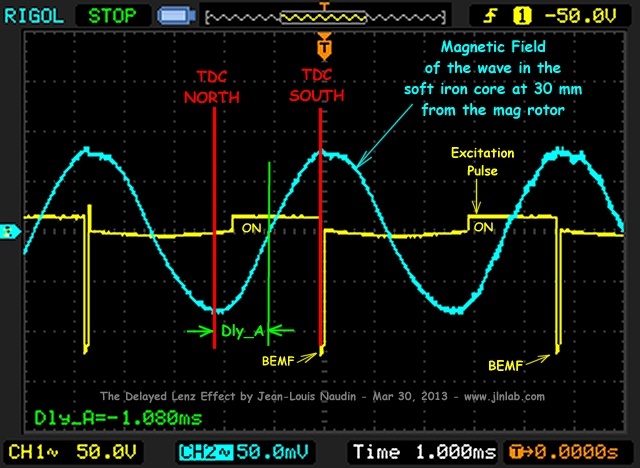 The yellow curve is the pulse sent by the controller to the excitation coil and used as reference, the blue curve is the measured magnetic field of the fluctation. At the bottom left, (Dly_A) is the value of the phase shifting (in ms) measured between the magnetic field of the rotor and the magnetic field of the fluctuation. Below the detailled analysis of the Delayed Lenz Effect phenomenon measured at a distance of 30 mm (optimal point for the max acceleration). 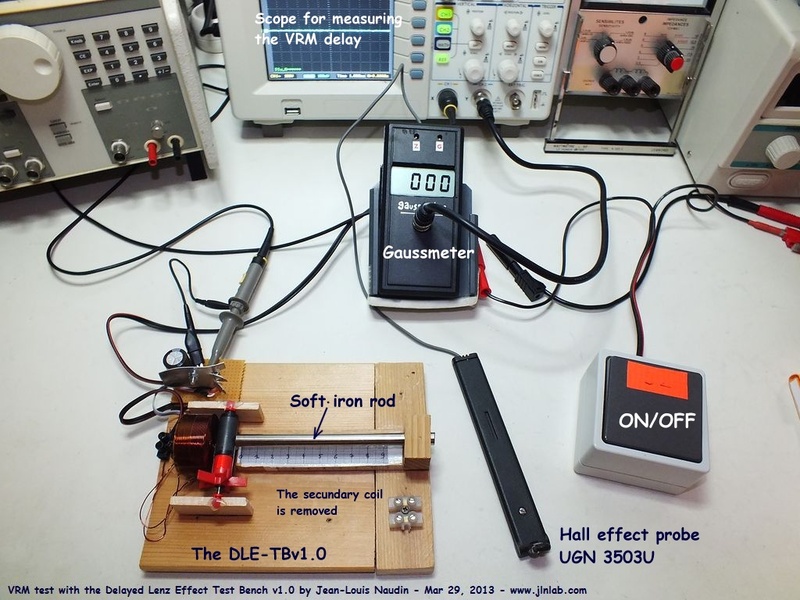 According to these three tests with the DLE-TB v1.0, we can now say that there is a relatively simple and effective method to optimize the DLE effect and produce the acceleration of the magnetic rotor. a VRM measurement helps to locate the phase shifting point. Below, an interesting video from the AT&T laboratories showing a mechanical analogy of transmission waves. 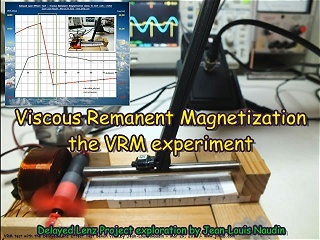 This allows us to understand what happens in the ferromagnetic rod of the secondary coil when the magnetic wave propagates and reflects off the coil producing the inversion of the Lenz effect.